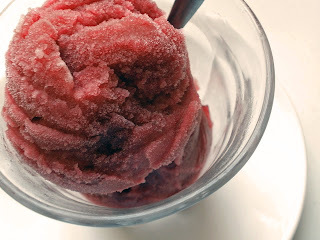 I adapted Tessa Kiros, Pomegranate Sorbet from her book, Apples for Jam. I really don't know why I've made this because in reality, I don't like pomegranate. However, I bought a bottle of POM Wonderful Juice from Woolies, having read this post from Chow Times. I still don't like it because to me, it taste like some cheap, low class red wine with a tart, sourish aftertaste. Being a good, do-not-want-to-waste (it's a whooping AUD5 for a bottle of 473ml! ), I churned them in the ice cream maker. If you ask me, I do not like pomegranate and neither do I like POM Wonderful Juice, but I have a love-hate relationship with this POM Sorbet. Miraculous isn't it sometimes the wonders that sugar and lemon juice does to you? Tessa Kiros uses 4 ripe pomegranate to extract 435ml of the pomegranate juice, minus the seeds. She used a levered juice extractor or a citurs juicer to extract and strain them. I substituted with equal amount of the POM Wonderful juice and 'discard' the rest into Aaron's little tummy. He thinks it tasted alright by itself, just like drinking red wines. Put the lemon juice in a small saucepan with all the sugar and 2-3 tablespoon of the pomegranate juice. Heat, stirring over medium-low heat until all the sugar has dissolved. Remove from the heat, to cool a little and then stir in the rest of the pomegranate juice. Pour the mixture into a bowl or container that has a lid. Chill it until very cold before churning them in an ice cream maker according to your manufacturer's instruction. I always churn them for 30minutes and that's it. You have to like pomegranate to like this sorbet.